He's one of the most controversial figures walking the political stage at the moment - but at the Venice Film Festival, Venezuelan President Hugo Chavez has been walking the red carpet. 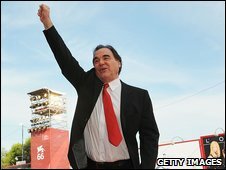 He was in Venice for the world premiere of director Oliver Stone's documentary examining his portrayal in the media. Hundreds of admirers turned out to greet him, some of them chanting "president, president" in Spanish. He played up to the part of movie star, meeting the public and throwing a flower into the crowd. He even took a photographer's camera to snap himself. Rumours that the president might be paying a "surprise" visit leaked out a day or so in advance - helped by the sudden presence of Venezuelan military officials in the city. Although the presence of celebrities from Tom Cruise to Brad Pitt and Angelina Jolie is commonplace during the festival, security was the tightest it's ever been, with armed guards checking bags and a tight cordon around the Palazzo Del Cinema. Seeing a man frequently described as a "dictator" by parts of the American media on such close terms with a prolific Hollywood director is one of the most interesting photo opportunities the festival has ever offered reporters. 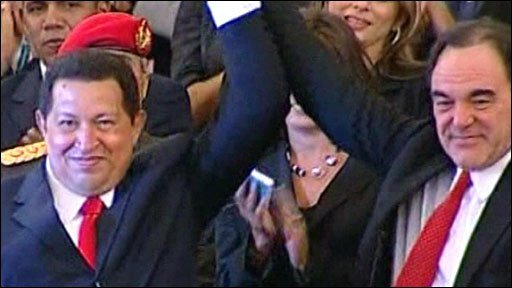 Hugo Chavez has been seen as a maverick - and much worse - since he was elected in 1998. He has been outspoken on US foreign policy and once described former President George Bush as a "donkey". It's earned him little favour from the more conservative elements of the American press. Within the last few days, Mr Chavez has signed an oil deal with Iran. Stone's documentary "South of the Border" started as an attempt to find out the truth behind the newspaper headlines about the Venezuelan leader. 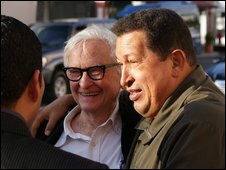 "The demonisation of Chavez has been intense to the point it's hilarious," Stone told the BBC. "We show that in the movie. "America is paranoid about its 'enemies', whether it's Venezuela, Iran or Iraq. I think there are dangerous consequences and this is an attempt to lessen that paranoia. "We wanted to emphasise the good things that have happened in Venezuela, like the poverty rate being cut by 50% since he assumed power. Even his enemies would say that on that front, Chavez has done well." Stone was granted unprecedented access and interview time with his subject, and from that the film grew into a full-scale tour around much of South America, meeting several heads of states - all of whom claim on camera to be supporters of Mr Chavez. Audiences see Stone playing soccer with Bolivian President Evo Morales, and asking Argentinian President Cristina Fernandez De Kirchner how many pairs of shoes she owns. But there are also less light-hearted subjects to document. "All the presidents I met confirmed all their countries are undergoing vast changes, and there is an anti-Washington consensus," he reports. "South America has been treated as North America's backyard for too long, and the pendulum has started to swing. Fidel Castro told me in an interview back in 2002 that that would happen, but I never believed it at the time. I believe only Mexico and Colombia could now be described as pro-USA." The director has come from making the movie convinced that Mr Chavez does not deserve the description of "dictator". "The guy has survived 12 electoral processes," he comments. "Jimmy Carter went down to supervise one of them and he called it the fairest election he had ever seen." From the scenes on the Venetian red carpet, Hugo Chavez and Oliver Stone have certainly formed a bond. In the movie, the president addresses Stone as "my brother". "I see him as a soldier," Stone says. "Most guys get weak, but he's gonna die with his boots on. He's got discipline." South of the Border got an enthusiastic reception from a critics' screening at Venice - but the very media Stone is examining is unlikely to respond warmly to the director's portrait of Mr Chavez - and Stone's final assessment that much of what he is doing is right. The Venice Film Festival runs until 12 September.